This article was posted to British Continental. You can read the original article here. George Jary and three other riders are keeping rider journals for The British Continental this season. George, 22, is funded by the Dave Rayner Fund and races for the Eiser Hirumet team in Spain. This is George’s third journal entry. 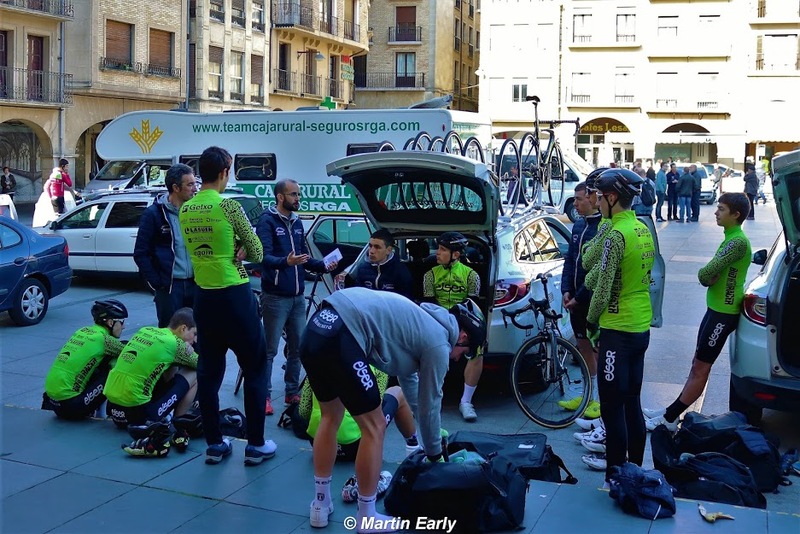 Eiser Hirumet was set up in 2016 when two long-standing Basque cycling clubs Punta Galea and Duranguesa combined their resources to form an Elite/U23 team. The following season, two big budget Basque teams, Infisport and Seguros Bilbao folded. Eiser Hirumet continued to grow, filling the void left by these two teams. Eiser picked up several riders along with the team coach from Seguros Bilbao. Eiser had a very successful 2017 season, the most notable results included the queen stage of the Vuelta Zamora and the prestigious Basque race the Circuito Aiala in Amurrio. Last season I joined the team from the Escribano team. It wasn’t the year anyone had hoped for but the team did make a big step forward in extending its calendar by competing in the Copa España. The Copa España was where my season started a month ago. The 4 hours in the 50kph washing machine and a further 8 travelling in the team van back to Durango left me a broken man. In the week following, I picked up the inevitable early season cold. I decided to race that weekend but I didn’t last long. 2 hours into the first Basque race of the season, in my favourite Lehendakari U23 series, I found myself unable to hold the pace of the bunch. The following weekend half of the team ventured 800km south to the second round of the Copa España in Murcia. Feeling recovered, I joined the other half for another Lehendakari race in Urretxu. 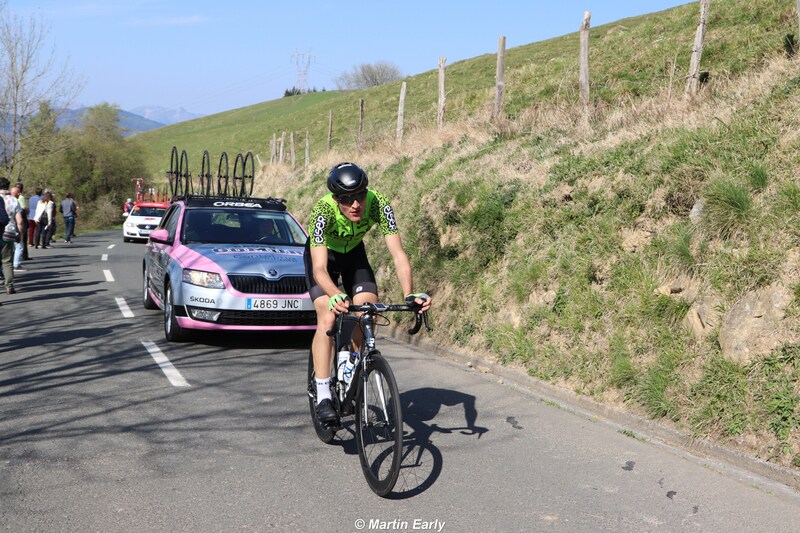 Just 40km from Durango, in the neighboring region of Gipuzkoa, Urretxu was where I managed what was a breakthrough result for me two seasons ago. At the time 4th felt like it could have been more, but looking back it is personal a landmark in my time racing in Spain. So, although the course has been changed entirely, it is a special race for me. This year the only point of difficulty on the course was the 3km climb of Azkarate which came 20km from the finish. Generally a group of 60 or so riders make it over Azkarate and contest a sprint. Our plan was to ride for Durango’s resident fast man Gontzal Garcia. Everything was going to plan until there was a big crash on the run in to the climb. The race was neutralised because both of the ambulances in the race convoy had to take riders to hospital. We were directed into a car park where we waited for another ambulance to arrive. When the race was resumed we were only a kilometer from the climb. The fight for position and the mad dash for the climb caused further crashes in the bunch, the second of which I was held up by. The group that made it over Azkarate included two of my teammates, Juan Cardenas, 50% of the team’s Colombian contingent, and our main man for the day Gontzal. Gontzal pulled off a great finish to claim 5th place. This was followed by Daniel Avellaneda, the other of the team’s two Colombian riders, sprinting for 2nd in the Copa España on the Sunday. 2nd and 5th in the Copa España and the Lehendakari races on the same weekend would be a good return for any team. But for us it also goes a long way to justifying the team’s strategy this season. Eiser Hirumet has two big areas of investment. The first of these is providing a double calendar all season long. 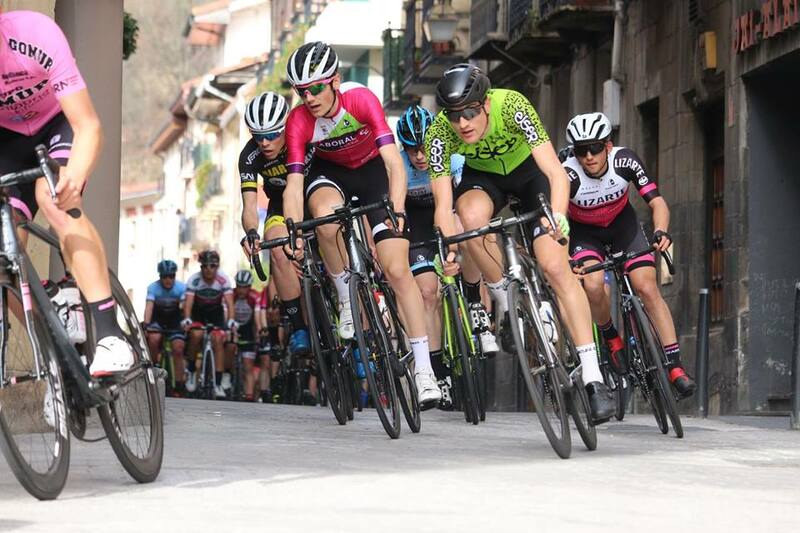 As well as the Basque races Eiser have entered every round of the Copa España, planned two trips to France and will be at Spain’s biggest amateur stage races this summer. Having so many races means riders of all levels can develop in the team. Going to two races each weekend does, however, come at the cost of weakening the team. Other Basque teams, many of whom operate on a larger budget than Eiser, have opted to focus on the local calendar. In Urretxu, for example, Eiser lined up with 9 guys, including 3 first year U23 riders. 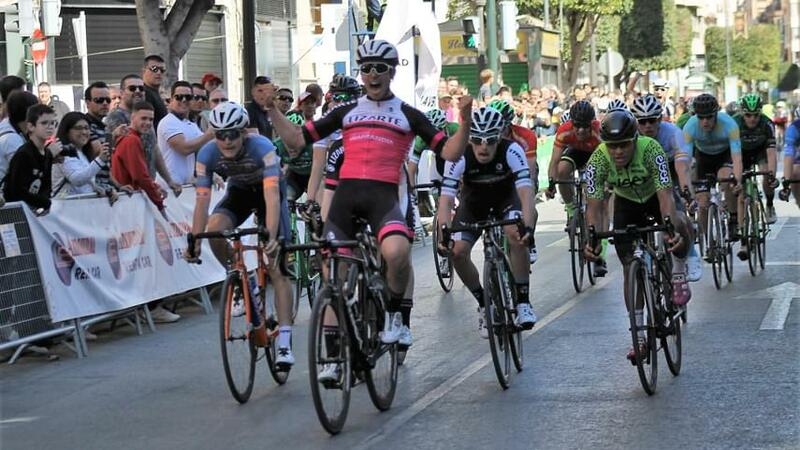 Meanwhile, other teams raced with a dozen riders, having even left one or two lads at home. Our Copa España team would also be stronger if we didn’t also send a team to the Basque races but this would come at the cost of leaving half of the team without a race. So, while most race expectations are limited when the team splits, a weekend where we manage a top 5 and a podium is one to celebrate. The other main area of investment is the team’s foreign contingent which is made up of 3 riders from South America, 4 Brits and a Frenchman. Signing riders from overseas is partly made necessary by the double calendar: more riders are needed to strengthen the squad. The team provides a flat and house for the foreign riders. Having riders from abroad also extends the inclusive philosophy of the team’s parent clubs. Along with the locals, the foreign riders help out with events such as training with the juniors/U16 riders, going into the local school and marshalling races and sportifs. We also provide something of a cultural exchange, each offering something different to the team. My flatmate, Hugo Rouland, moved to Durango from Lyon in June last year. When he isn’t in the breakaway in the Copa España, Hugo studies in Bilbao in an Erasmus exchange. In a few weeks he’ll have finished a master’s degree in Engineering in Spanish… his 3rd language. Our training partner Juan Cardenas, couldn’t be more different to Hugo. Juan comes from a small village of 5000 habitants in North Eastern Colombia. Colombian riders are only allowed to spend 3 months in Europe at a time, unless they acquire a work visa. 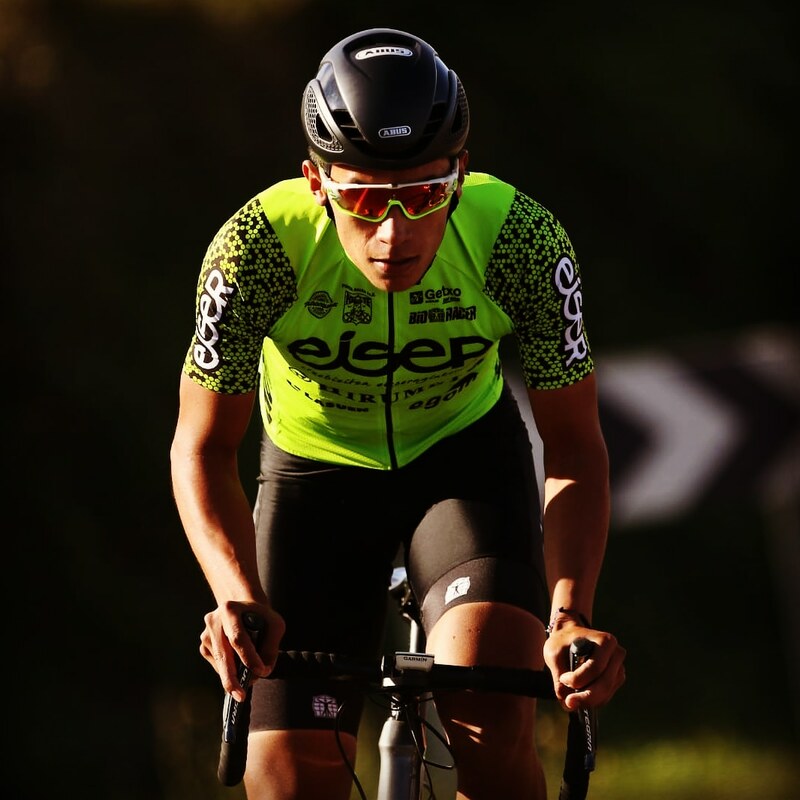 In the last 3 years, Juan has made the most of his yearly 3 months in Spain, racing for the Punta Galea junior team in 2017 and for Eiser in the last two seasons. Juan recognises that his opportunities in Colombia are limited, as do his friends and family who help him fund his flights. These precious 90 days are Juan’s chance to show what he can do in Europe in the hope of making a career out of cycling. As well as being keen to offer opportunities to those hoping to make it as professional riders, the team recognises what the foreign riders bring to the team off the bike. A local rider who might be struggling to find time to train and study can learn a lot from having a teammate doing a master’s degree in their 3rd language. Others could be reminded of how fortunate they are to be living in a region with such a well-funded racing scene when they meet a rider from the other side of the world limited to 3 months of racing. You can read George’s excellent blog here.